Bringing proceedings and obtaining and enforcing judgements is not an easy process under any circumstances, but this is further complicated if the defendant is a foreign national or resides abroad. For reasons of state sovereignty and international relations, defendants in foreign states--whether citizens of business ventures--cannot be proceeded against in the same way as a country's own nationals. Initiating proceedings against someone who is abroad requires the permission, and often the assistance, of the authorities of the foreign state. Assistance is needed especially in relation to, inter alia , the service of documents, discovery and the taking of evidence from parties or witnesses to the proceedings. 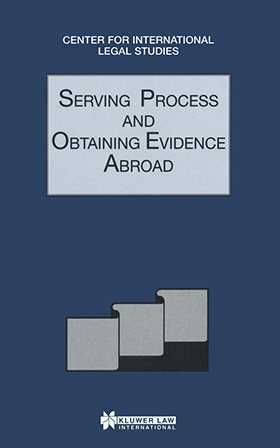 This book explores the rights of countries to request assistance and their rights to refuse assistance. It covers the methods by which assistance may be obtained, for example through the judiciary or through diplomatic channels, and the issue of sovereign immunity. Also, this work discusses the use of letters rogatory, an important tool in the obtaining of assistance abroad, and raises the issue of differences between Common Law and Civil Law jurisdictions, especially with regard to the process of discovery of evidence.